THIS SHOW IS IDEAL FOR ALL TYPES OF VENUE AND WILL HAVE AUDIENCES OF ALL AGES HOPPING AND BOPPING IN NO TIME AT ALL FEATURING ALL THE GREATEST HITS OF BUDDY INCLUDING :- RAVE ON , PEGGY SUE , OH BOY , HEARTBEAT ,TRUE LOVE WAYS , THAT’LL BE THE DAY…………..
Lynroys Cabaret Bar & Restaurant – Loughborough , Leicestershire What a super show! Thanks for another wonderful performance at Lynroys . 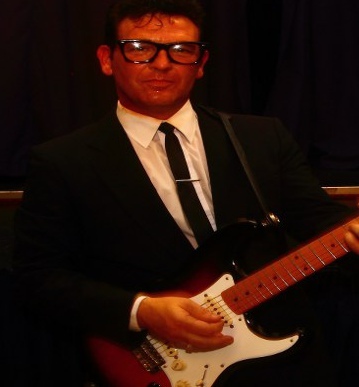 Your tribute to Buddy Holly & The Legends of Rock ‘n’ Roll was superb. You are certainly popular here at our venue . Having booked your show many occasions , We must say that you are an excellent performer and always have the dance floor packed ! The York Hotel – Minehead , Somerset He performed a fantastic tribute to Buddy Holly & Legends of Rock ‘n’ Roll Show at my venue . His amazing tribute to Buddy Holly and his vocals were outstanding . And to top the whole evening off Legends of Rock ‘n’ Roll show was purely spectacular . The audience wouldn,t let his get off the stage ! I would personally recommend him to anyone .